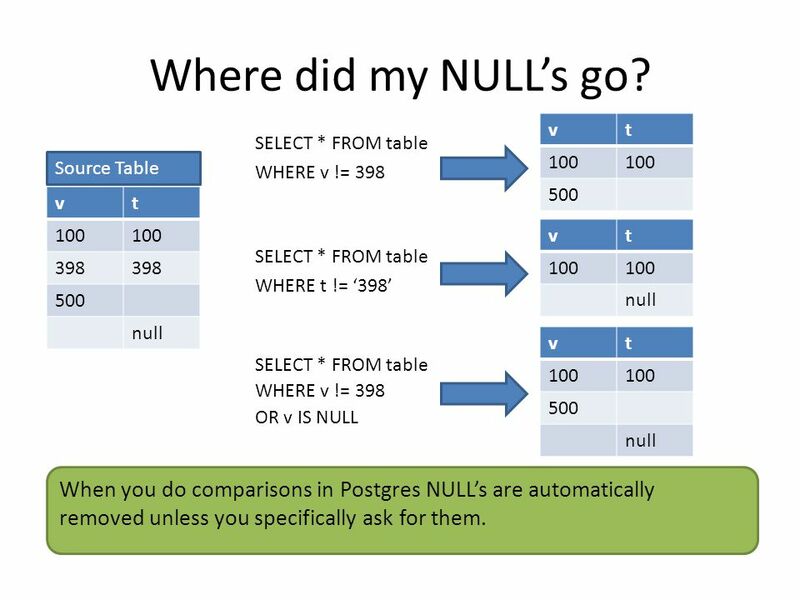 Postgres Tips and Tricks By Lloyd Albin 5/1/2013, 6/11/2013. 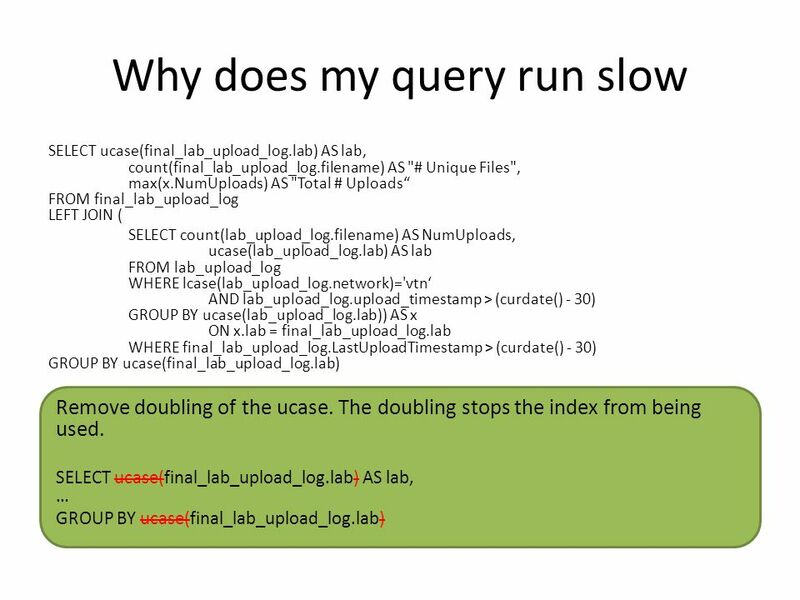 3 Why does my query run slow SELECT max(l1.upload_timestamp) AS LastUploadTimestamp, lcase(l1.network) as network, l1.filename, count(l1.file_id) AS NumberUploads FROM lab_upload_log AS l1 GROUP BY lcase(l1.network), l1.filename CREATE INDEX lab_upload_log_idx ON lab_data_ops.lab_upload_log USING btree (network, filename); Create a functional index for the field CREATE INDEX lab_upload_log_idx2 ON lab_data_ops.lab_upload_log USING btree (lower(network), filename); Create an index for the field if you are going to use the field in a WHERE clause or a GROUP BY clause. 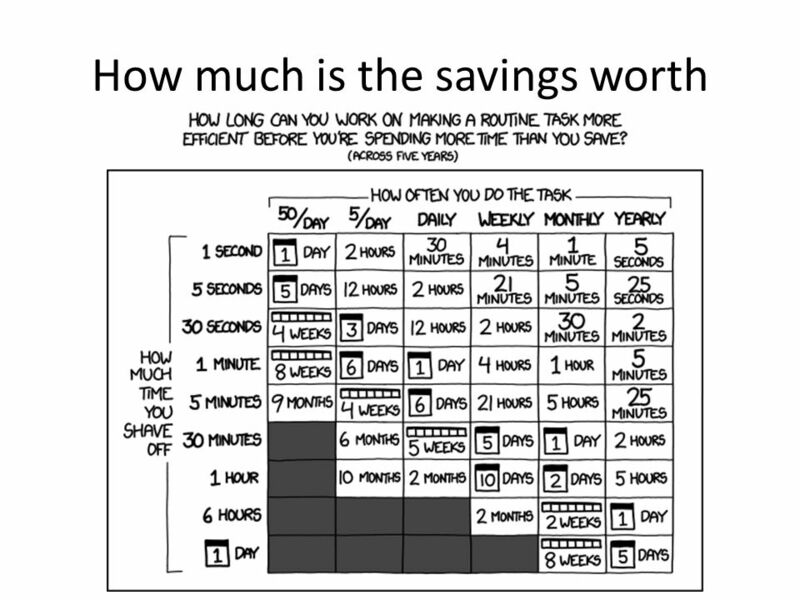 7 Reduce Code Don’t write the same query in two different places. This causes you to have to maintain twice as much code and makes it so that when people are updating the code, that they may only catch one instance of the code. 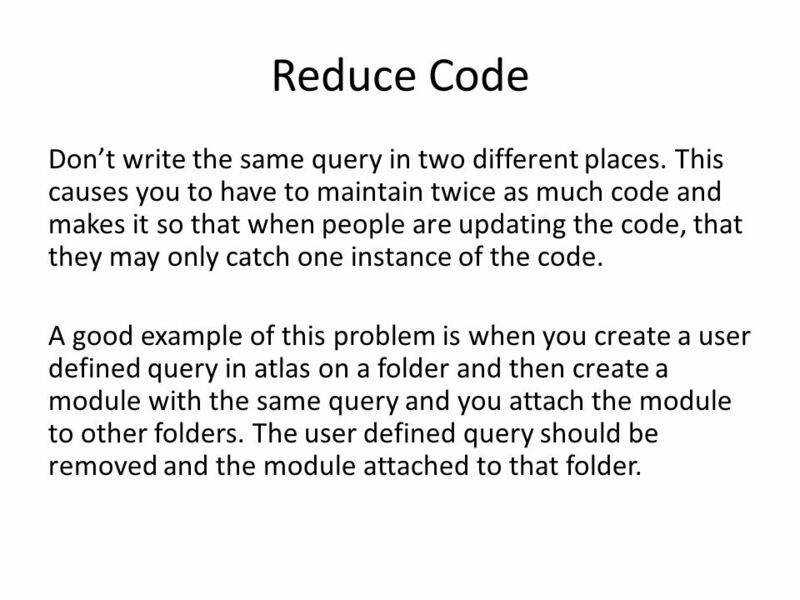 A good example of this problem is when you create a user defined query in atlas on a folder and then create a module with the same query and you attach the module to other folders. 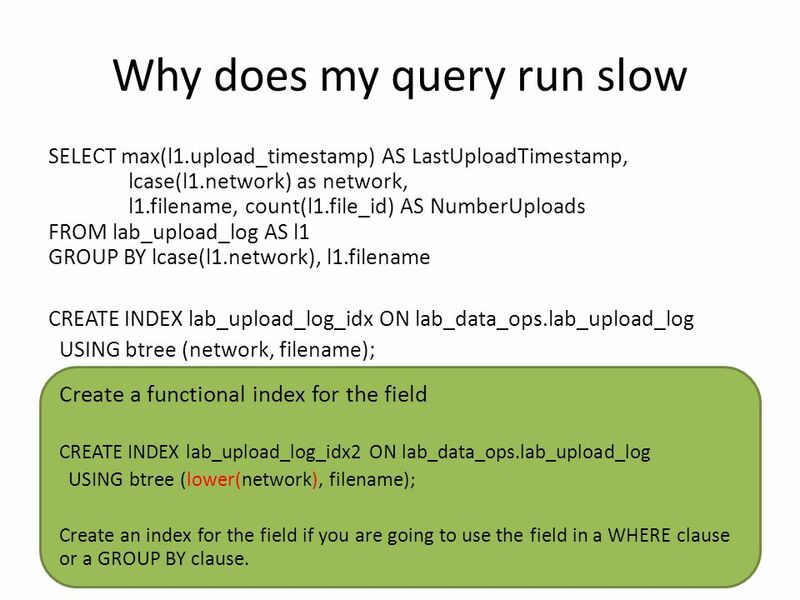 The user defined query should be removed and the module attached to that folder. 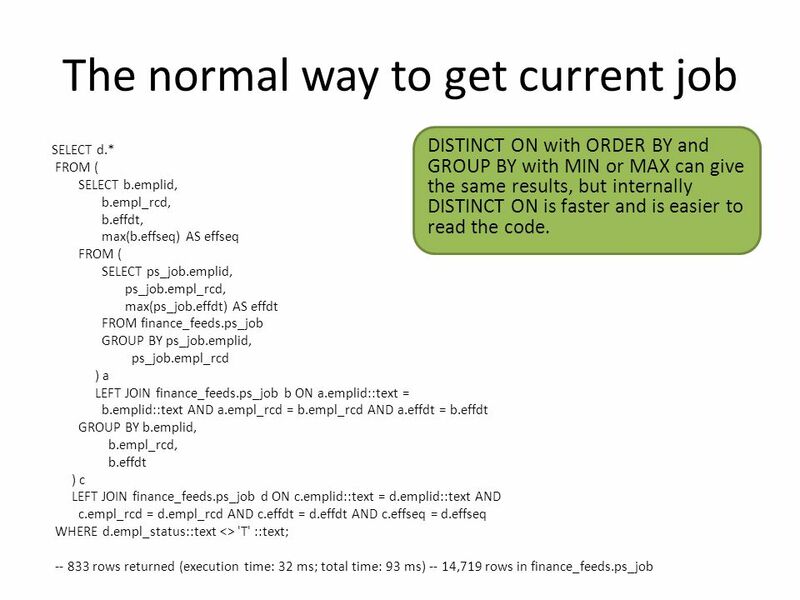 10 The normal way to get current job SELECT d.* FROM ( SELECT b.emplid, b.empl_rcd, b.effdt, max(b.effseq) AS effseq FROM ( SELECT ps_job.emplid, ps_job.empl_rcd, max(ps_job.effdt) AS effdt FROM finance_feeds.ps_job GROUP BY ps_job.emplid, ps_job.empl_rcd ) a LEFT JOIN finance_feeds.ps_job b ON a.emplid::text = b.emplid::text AND a.empl_rcd = b.empl_rcd AND a.effdt = b.effdt GROUP BY b.emplid, b.empl_rcd, b.effdt ) c LEFT JOIN finance_feeds.ps_job d ON c.emplid::text = d.emplid::text AND c.empl_rcd = d.empl_rcd AND c.effdt = d.effdt AND c.effseq = d.effseq WHERE d.empl_status::text <> 'T' ::text; -- 833 rows returned (execution time: 32 ms; total time: 93 ms) -- 14,719 rows in finance_feeds.ps_job DISTINCT ON with ORDER BY and GROUP BY with MIN or MAX can give the same results, but internally DISTINCT ON is faster and is easier to read the code. 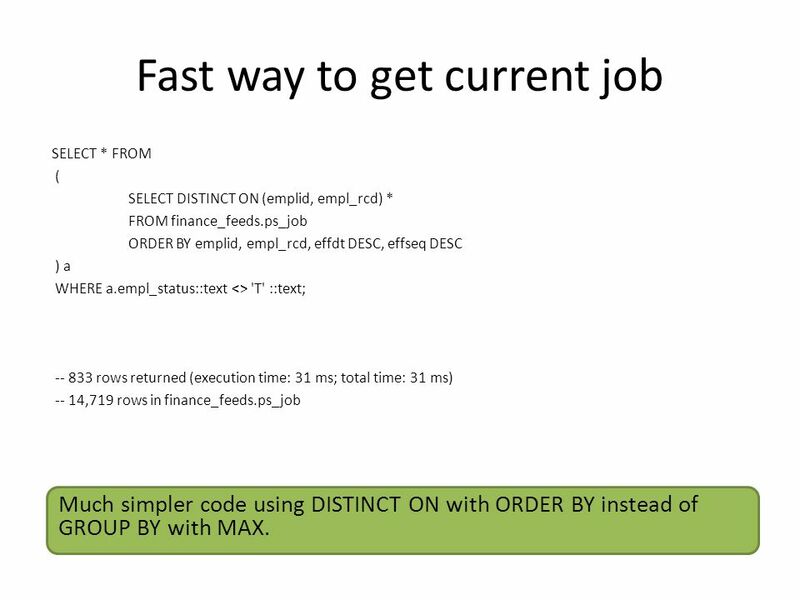 11 Fast way to get current job SELECT * FROM ( SELECT DISTINCT ON (emplid, empl_rcd) * FROM finance_feeds.ps_job ORDER BY emplid, empl_rcd, effdt DESC, effseq DESC ) a WHERE a.empl_status::text <> 'T' ::text; -- 833 rows returned (execution time: 31 ms; total time: 31 ms) -- 14,719 rows in finance_feeds.ps_job Much simpler code using DISTINCT ON with ORDER BY instead of GROUP BY with MAX. 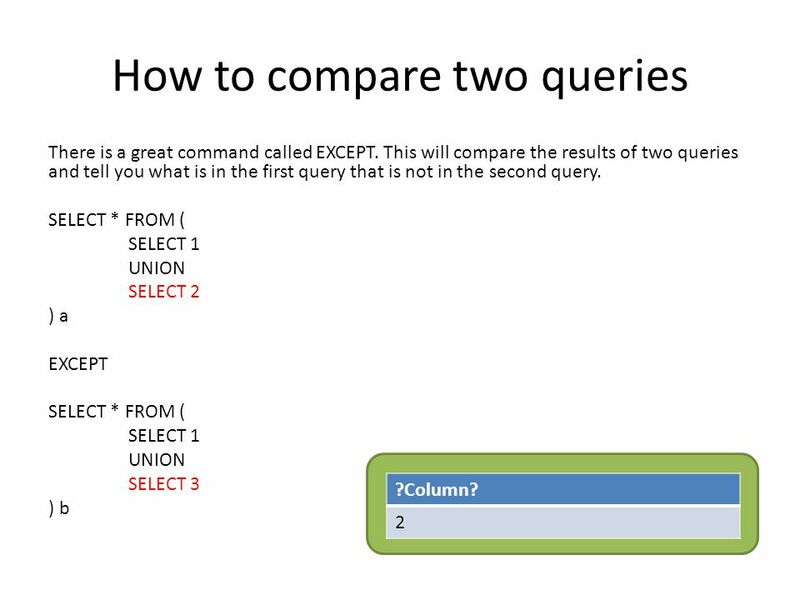 13 How to compare two queries There is a great command called EXCEPT. 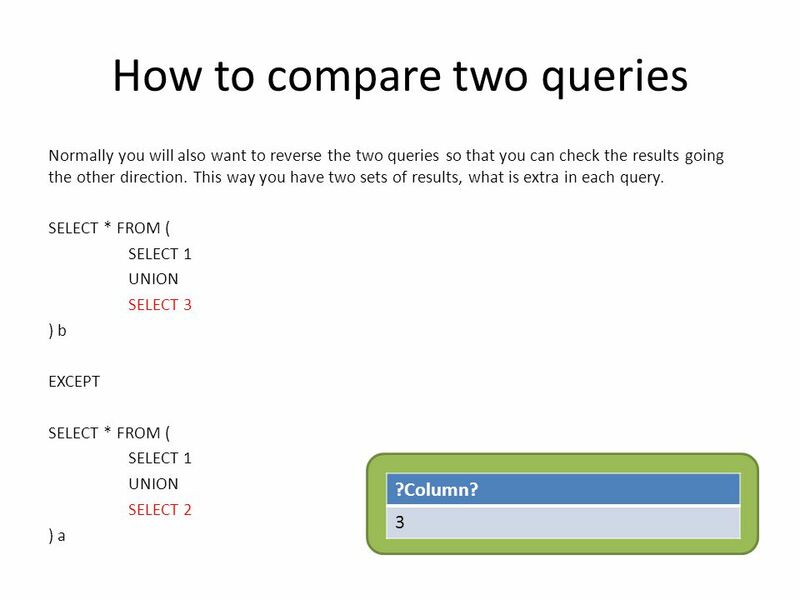 This will compare the results of two queries and tell you what is in the first query that is not in the second query. SELECT * FROM view_a EXCEPT SELECT * FROM view_b SELECT * FROM (SELECT * FROM view_a)) a EXCEPT SELECT * FROM (SELECT * FROM view_b)) b This will show you all lines in view_a that are not in view_b. 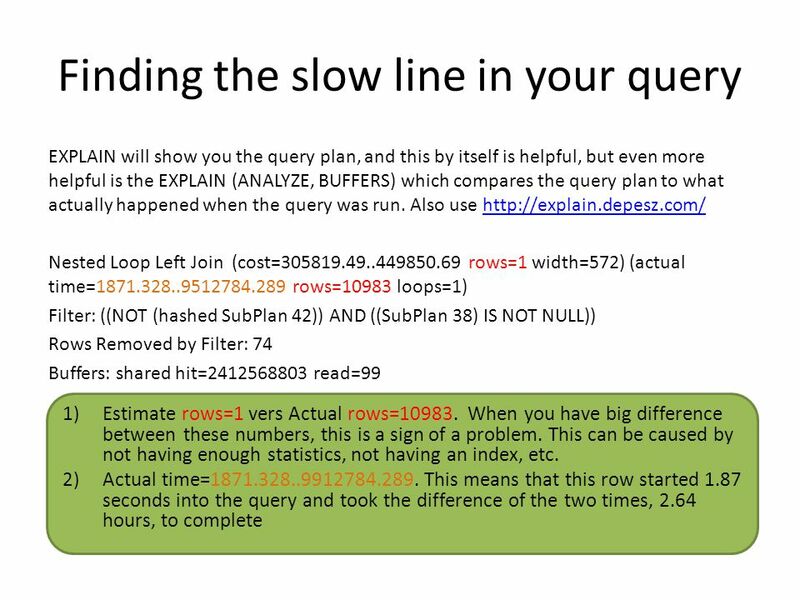 To find out all lines on view_b that are not in view_a, reverse the two queries. 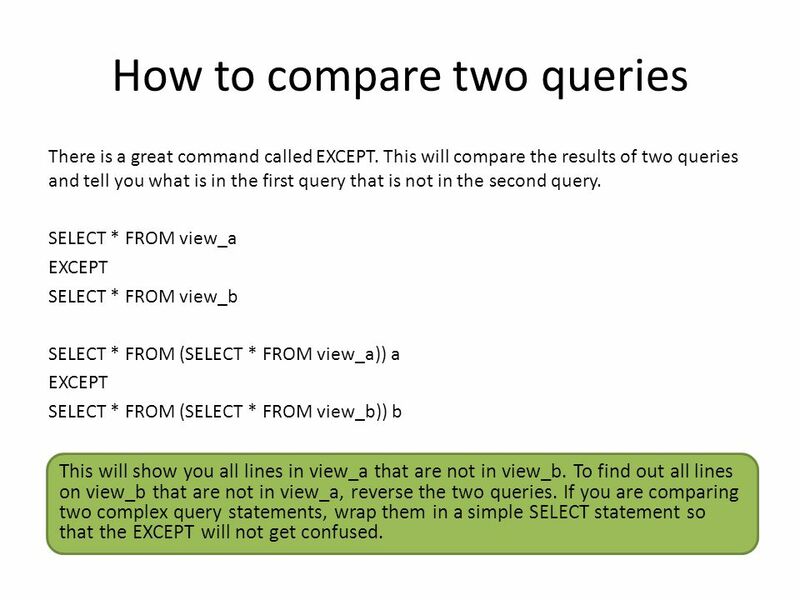 If you are comparing two complex query statements, wrap them in a simple SELECT statement so that the EXCEPT will not get confused. 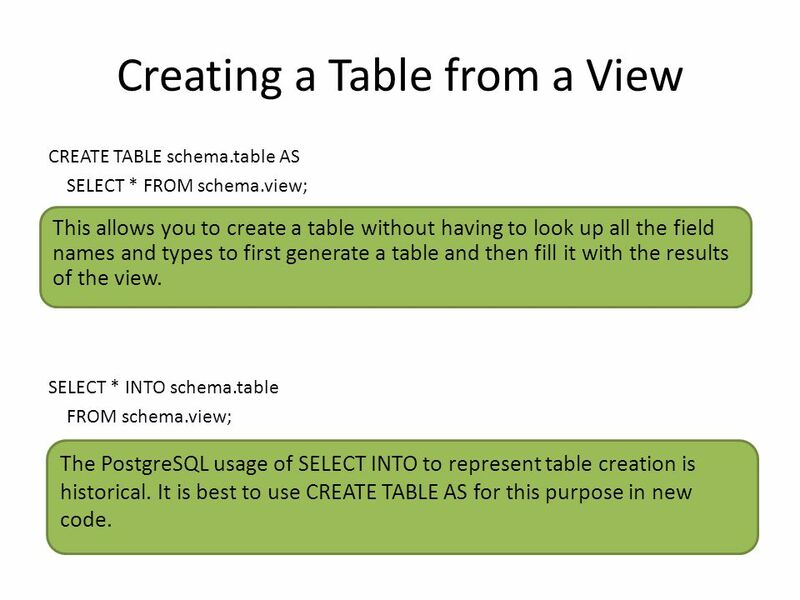 19 Creating a Table from a View CREATE TABLE schema.table AS SELECT * FROM schema.view; SELECT * INTO schema.table FROM schema.view; The PostgreSQL usage of SELECT INTO to represent table creation is historical. 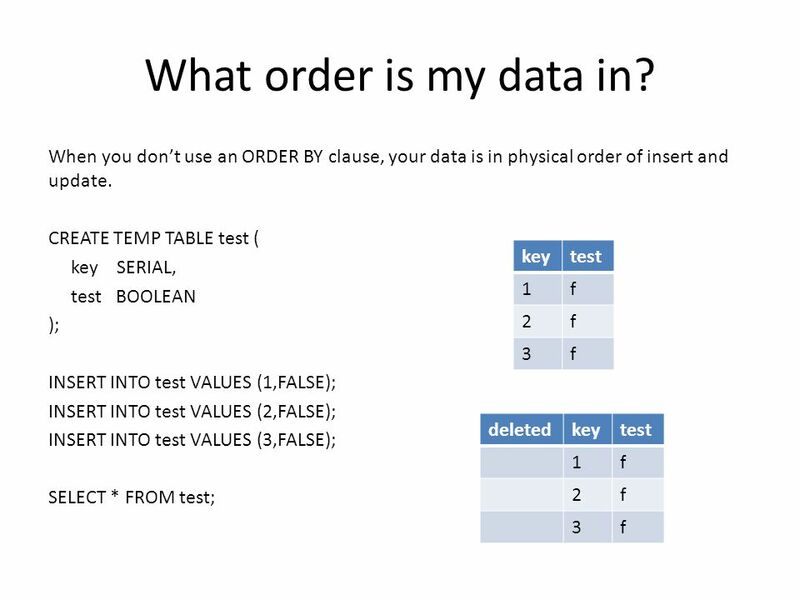 It is best to use CREATE TABLE AS for this purpose in new code. 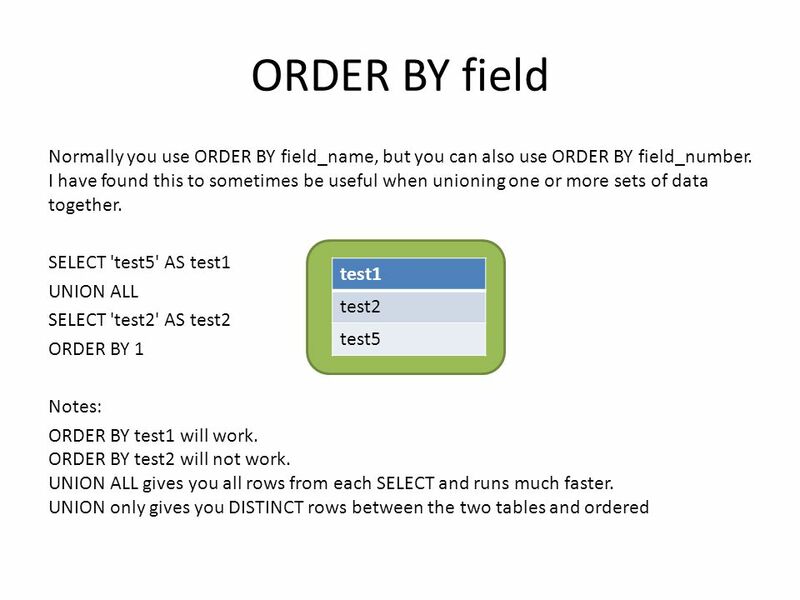 This allows you to create a table without having to look up all the field names and types to first generate a table and then fill it with the results of the view. 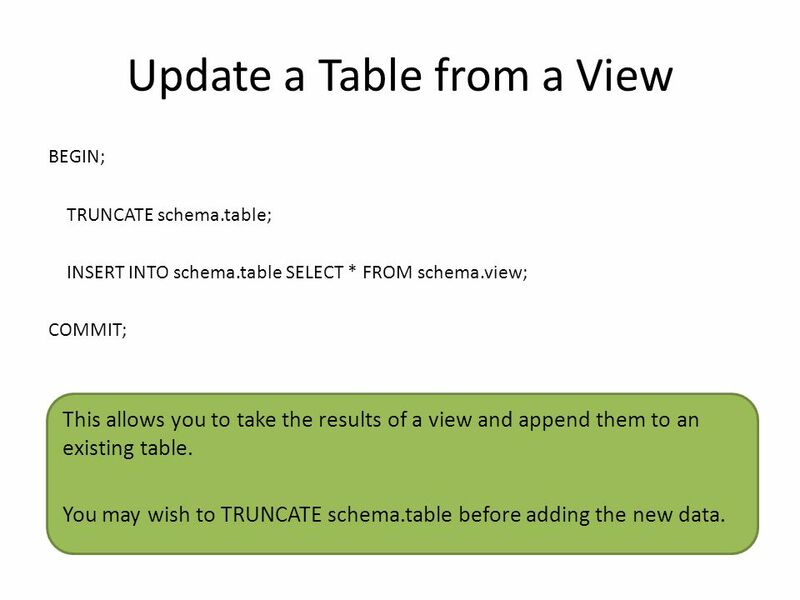 20 Update a Table from a View BEGIN; TRUNCATE schema.table; INSERT INTO schema.table SELECT * FROM schema.view; COMMIT; This allows you to take the results of a view and append them to an existing table. 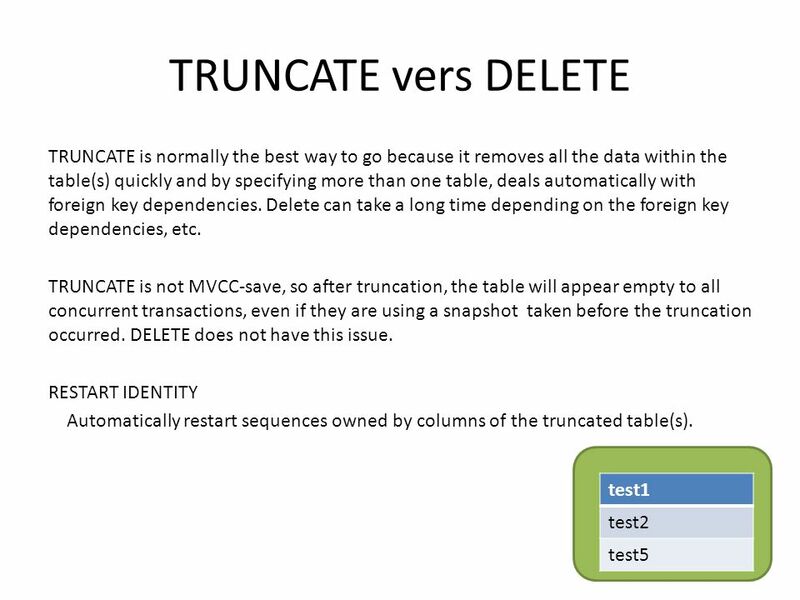 You may wish to TRUNCATE schema.table before adding the new data. 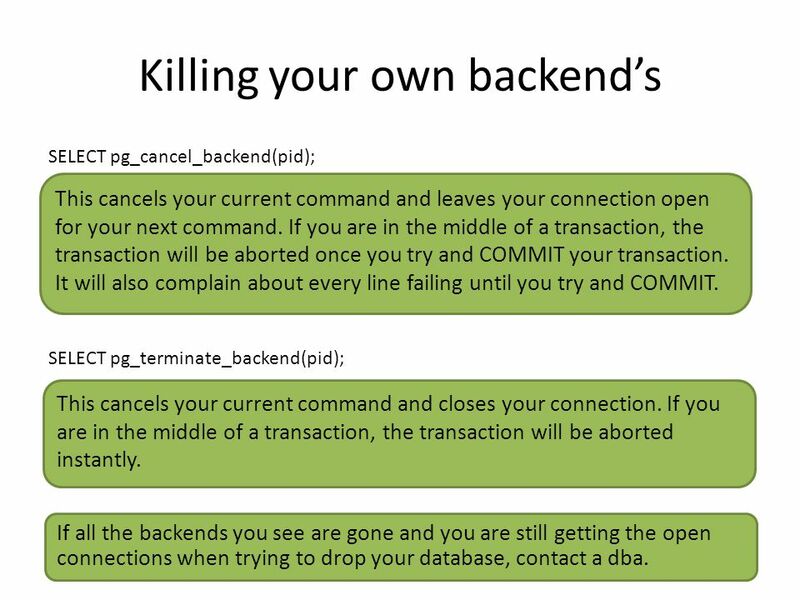 28 Killing your own backend’s SELECT pg_cancel_backend(pid); SELECT pg_terminate_backend(pid); This cancels your current command and closes your connection. If you are in the middle of a transaction, the transaction will be aborted instantly. This cancels your current command and leaves your connection open for your next command. If you are in the middle of a transaction, the transaction will be aborted once you try and COMMIT your transaction. It will also complain about every line failing until you try and COMMIT. 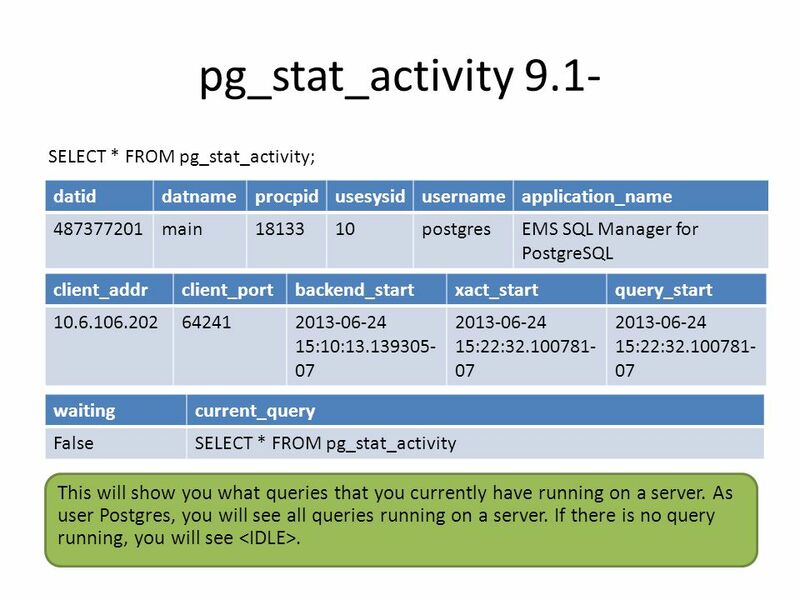 If all the backends you see are gone and you are still getting the open connections when trying to drop your database, contact a dba. 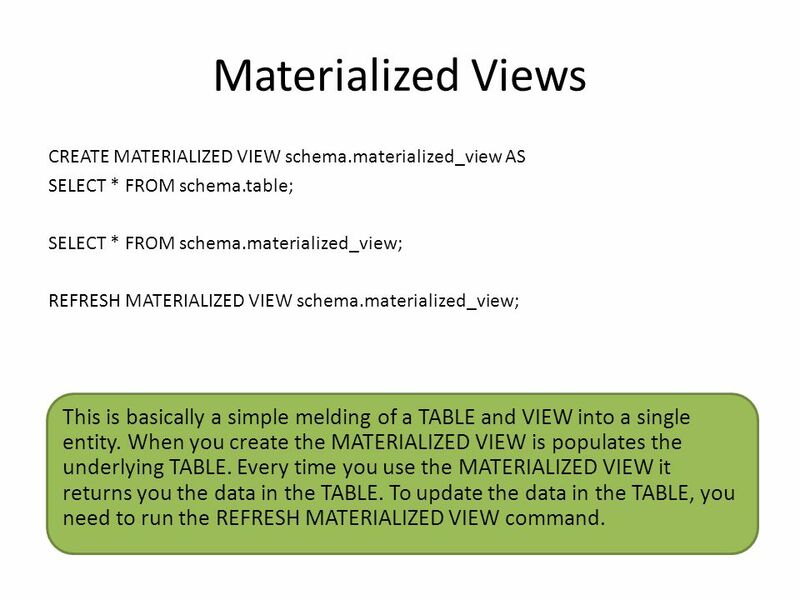 30 Materialized Views CREATE MATERIALIZED VIEW schema.materialized_view AS SELECT * FROM schema.table; SELECT * FROM schema.materialized_view; REFRESH MATERIALIZED VIEW schema.materialized_view; This is basically a simple melding of a TABLE and VIEW into a single entity. When you create the MATERIALIZED VIEW is populates the underlying TABLE. Every time you use the MATERIALIZED VIEW it returns you the data in the TABLE. 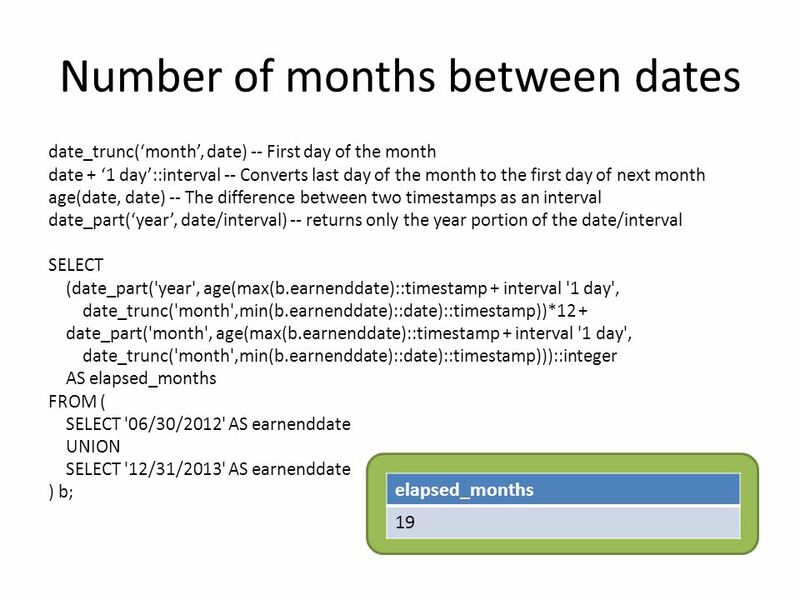 To update the data in the TABLE, you need to run the REFRESH MATERIALIZED VIEW command. 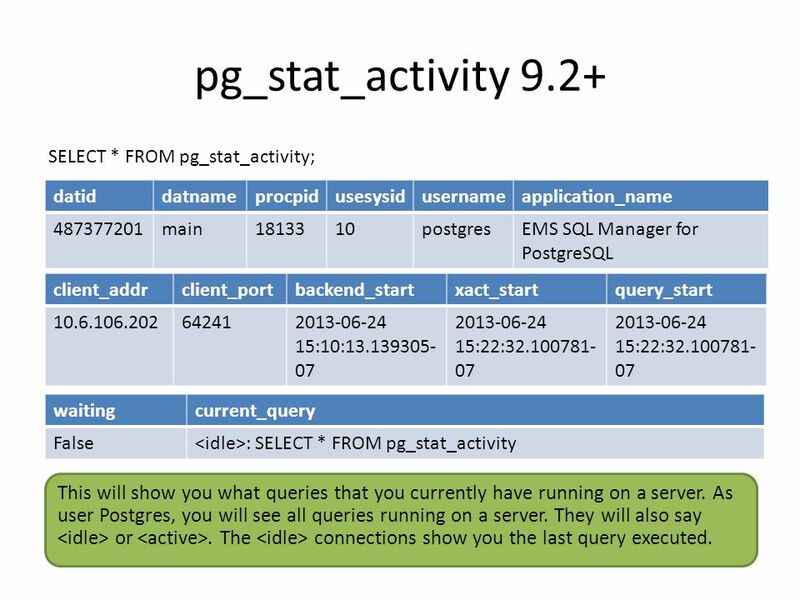 31 Foreign Data Tables CREATE EXTENSION postgres_fdw; CREATE SERVER db_main FOREIGN DATA WRAPPER postgres_fdw OPTIONS (host 'db.scharp.org', dbname 'main', port '5432'); CREATE USER MAPPING FOR postgres SERVER db_main OPTIONS (user 'webservices', password 'password'); CREATE FOREIGN TABLE ist.webservices_token ( "time" TIMESTAMP WITHOUT TIME ZONE DEFAULT now() NOT NULL, token TEXT NOT NULL ) SERVER db_main; SELECT * FROM ist.webservices_token; The Postgres DBA’s should take care of the EXTENSION, SERVER and USER MAPPING’s. The developer can then create the FOREIGN TABLES. 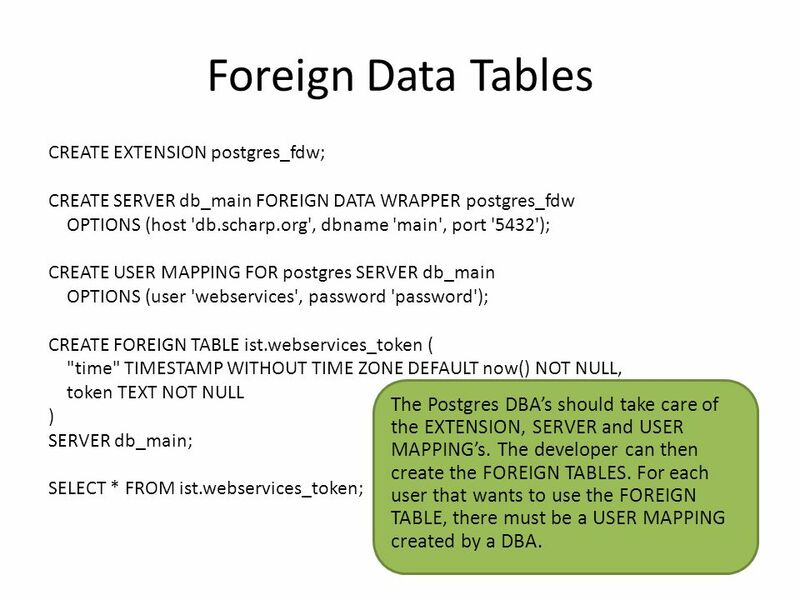 For each user that wants to use the FOREIGN TABLE, there must be a USER MAPPING created by a DBA. 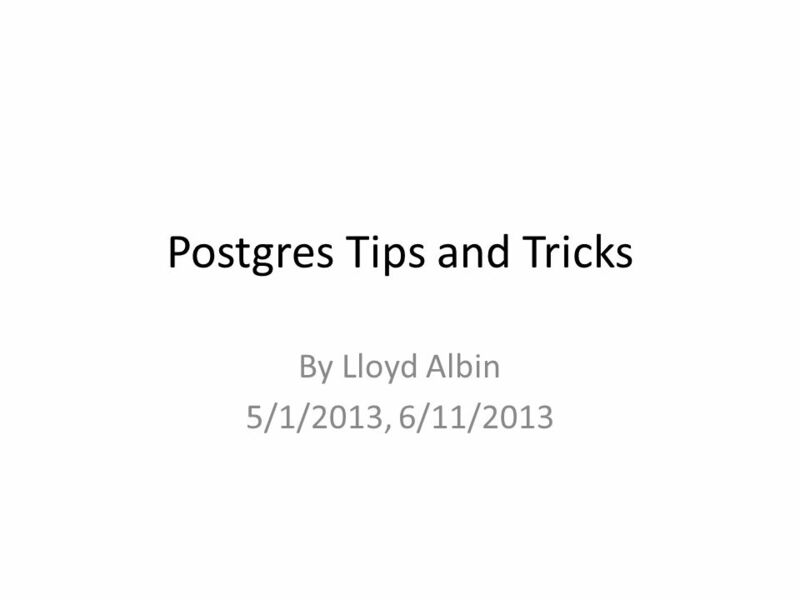 Download ppt "Postgres Tips and Tricks By Lloyd Albin 5/1/2013, 6/11/2013." 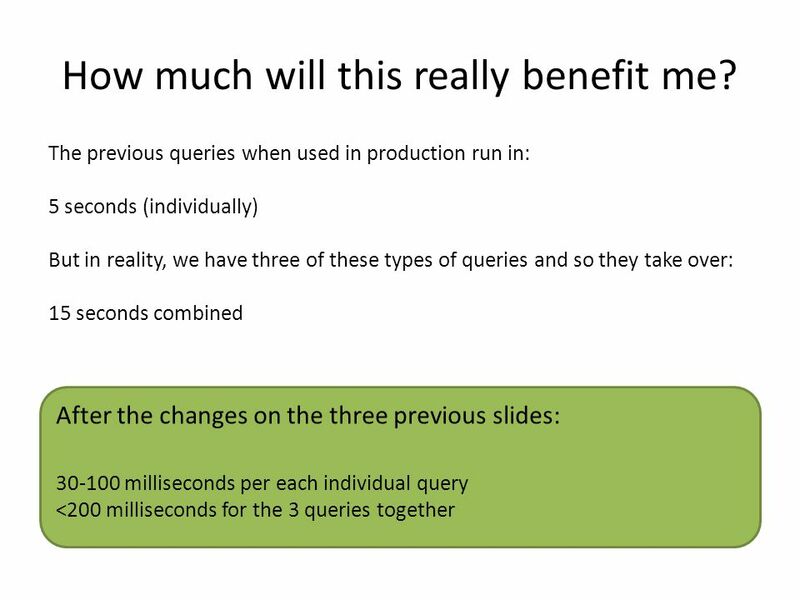 SUBQUERIES. 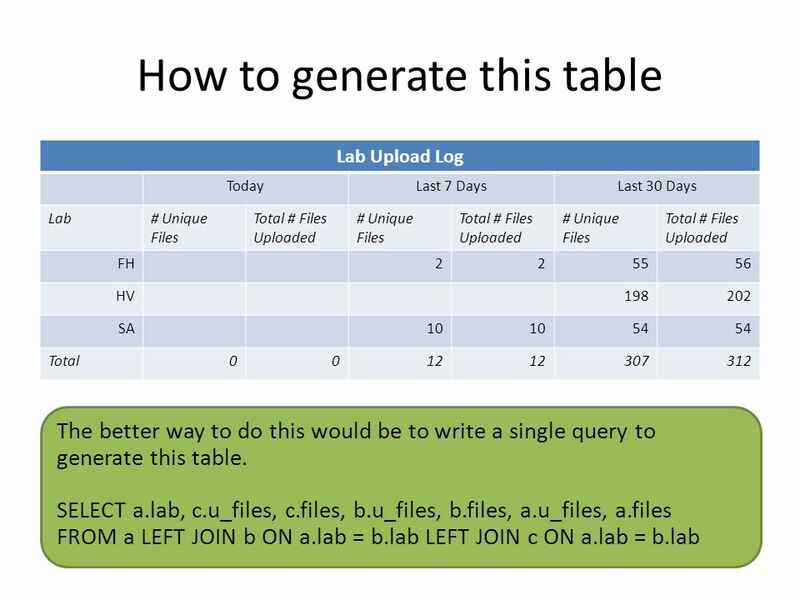 ACTIVITY 4-1 Create a database called Subexamples Start a logfile called ACT4-1 Save the subtext.txt file – Copy the contents of the file. Hui Li Pig Tutorial Hui Li Some material adapted from slides by Adam Kawa the 3rd meeting of WHUG June 21, 2012. 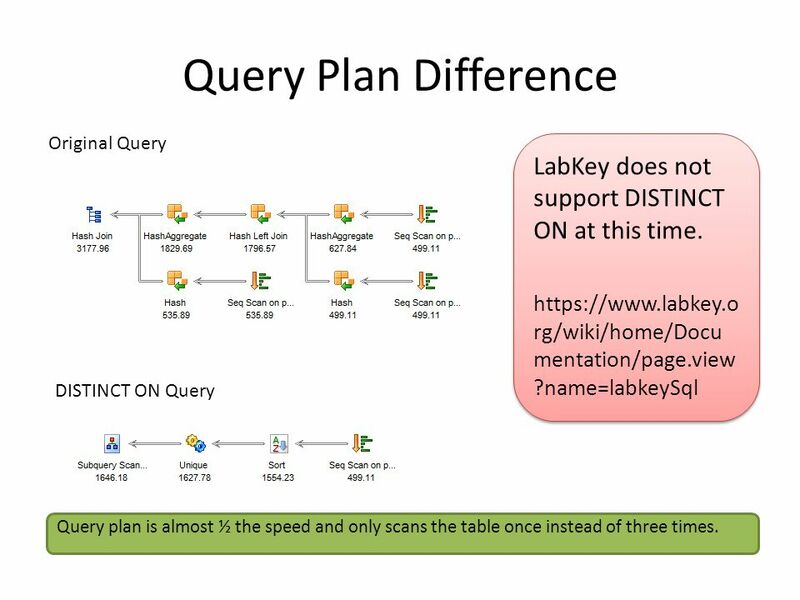 Lab 9: Matrix Keypad : ”No Key Press” Analysis Slide #2 Slide #3 ”Press and Hold Key 5” Analysis. Hierarchies & Trees in SQL by Joe Celko copyright 2008. Final Project of Information Retrieval and Extraction by d 吳蕙如. 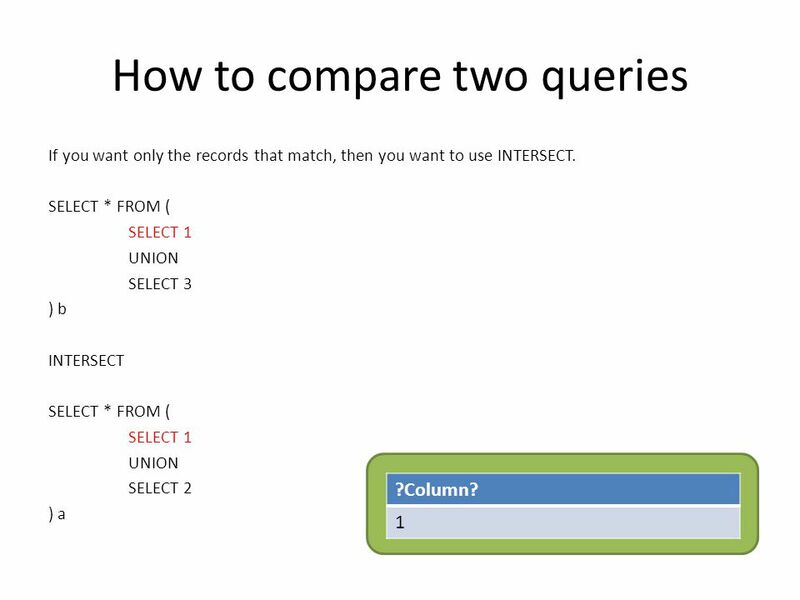 Introduction to Relational Databases Obtained from Portland State University. Midterm Review Lecture 14b. 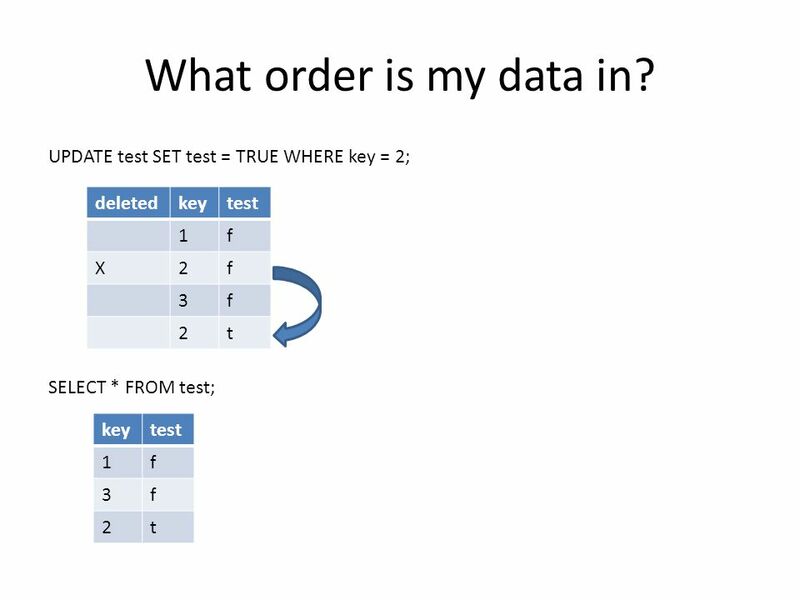 14 Lectures So Far 1.Introduction 2.The Relational Model 3.Disks and Files 4.Relational Algebra 5.File Org, Indexes 6.Relational. Inverted Indices. Inverted Files Definition: an inverted file is a word-oriented mechanism for indexing a text collection in order to speed up the searching. Large Scale Findability Analysis Shariq Bashir PhD-Candidate Department of Software Technology and Interactive Systems. ACS-4902 Ron McFadyen Chapter 15 Algorithms for Query Processing and Optimization. 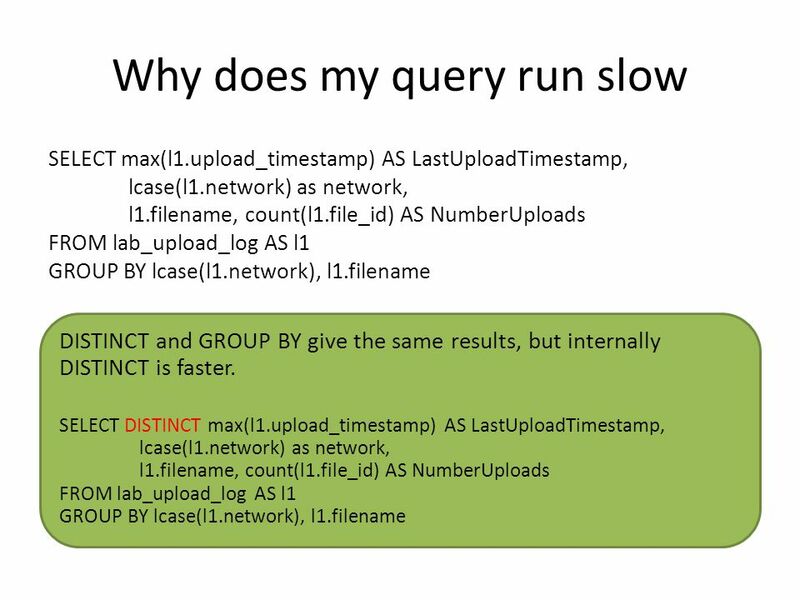 Quick Review of Apr 15 material Overflow –definition, why it happens –solutions: chaining, double hashing Hash file performance –loading factor –search. Some slides adapted from A. Silberschatz et al. Database System Concepts, 5th Ed. Review Database Management Systems I Alex Coman, Winter 2006. Let SAS Do the Coding for You! Robert Williams Business Info Analyst Sr. WellPoint Inc.